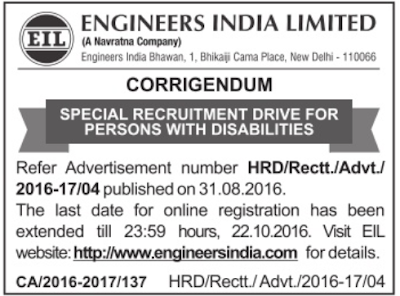 Engineers India Limited i.e EIL, A Government of India Undertaking is looking for (PWD Candidates Only) Manager, Engineers and Draftsman. The last date for submission of online applications is 22nd October 2016. Engineers India Limited is a Navratna public-sector undertaking of the Government of India under the Ministry of Petroleum and Natural Gas. (a) Graduate in Commerce and Company Secretary (CS) qualification with minimum 55% marks or eqv. CGPA/ CPI from Institute of Company Secretaries (ICSI) & an Associate/Fellow Member of ICSI. (b) 12 years post qualification experience in Secretarial matters including statutory and regulatory compliances, corporate governance, board meetings, etc. Compliances relating to Companies Act 1956/2013 alongwith rules and secretarial standards, Stock exchange, SEBI laws, etc. Knowledge of drafting/amendments in documents such as Delegation of powers, agreements, MoU, company resolutions, etc. Should be well versed with powers available with Navratna PSUs, DPE & Govt. guidelines. (c) Out of 12 years post qualification experience, minimum 5 years should be in a Listed Company. Preference will be given to candidates having past experience in Public Sector Undertakings (PSUs). (a) BE/ B. Tech/ B.Sc. (Engg.) in Civil discipline with minimum 65% marks or eqv. CGPA/ CPI and ME/M. Tech/M.Sc. (Engg.) in Structural discipline with minimum 65% marks or eqv. CGPA/ CPI. (b) 3 years post qualification experience in analysis, design and detailing of structures preferably bridges in reputed consultancy organization. (a) BE/ B. Tech/ B.Sc. (Engg.) in Civil discipline with minimum 65% marks or eqv. CGPA/ CPI. (b)ME/M. Tech/M.Sc. (Engg.) in Structural discipline with minimum 65% marks or eqv. CGPA/ CPI. (a) BE/ B. Tech/ B.Sc. (Engg.) in Chemical discipline with minimum 65% marks or eqv. CGPA/ CPI. (b) ME/M. Tech/ M.Sc. (Engg.) in Chemical or Corrosion Science with minimum 65% marks or eqv. CGPA/ CPI. (b) ME/M. Tech/ M.Sc. (Engg.) in Environmental Science discipline with minimum 65% marks or eqv. CGPA/ CPI. (a) Diploma in Civil Engineering with minimum 65 % marks or eqv. CGPA/ CPI from an Institution duly recognized by AICTE. (b) 13 years post qualification experience in drafting (Civil) with Experience in drafting in Auto Cad and/or Micro station. Experience in PDS/PDMS for 3D Modeling will be preferred. Above 35 (as on 30/08/2016): Manager - 50 Years, Senior Engineer - 42 Years, Engineer - 38 Years, Draftsman - 48 Years. For all the positions (except Draftsman) will be through Interview. For Draftsman, the mode of selection will be through Skill Test. The candidates may apply through online registration system on EIL website. The last date for submission of online applications is 30/09/2016 (Extended up to 22/10/2016 till 23:59 Hours).